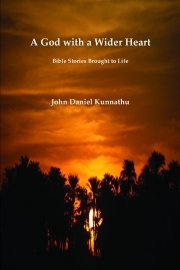 Description of "A God with a Wider Heart"
A few Bible stories are retold with a deeper vision of spirituality, a loftier vision of God, and a universal vision of humanity. These stories will help anyone to lay a stronger foundation for his/her life. They have the power to transform communities as well. John D. Kunnathu is an educator and an author of several books. Born and brought up in India, he spent almost a decade in Africa before he settled in the US. His life experiences helped him develop a global outlook, which is clearly reflected in his work. His other major works include An Orientation of our Life, and An Adventure Trip with God. Reviews of "A God with a Wider Heart"